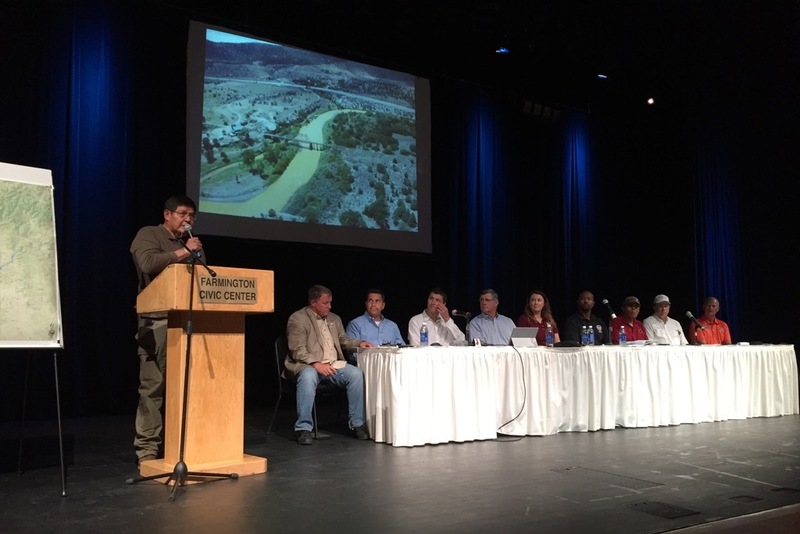 of Aztec representatives at a public meeting held at the Farmington Civic Center on August 8, 2015. Courtesy photo. FARMINGTON, N.M. – Navajo Nation Council Speaker LoRenzo Bates (Nenahnezad, Newcomb, San Juan, Tiis Tsoh Sikaad, Tse’Daa’Kaan, Upper Fruitland) on Saturday, attended a public meeting at the Famirngton Civic Center in which New Mexico State Environment Department Secretary Ryan Flynn, State Engineer Tom Blaine, as well as San Juan County, City of Farmington, and City of Aztec representatives provided updates regarding the ongoing contamination of the Animas River in Colorado and the San Juan River in New Mexico. People that are on municipal or domestic systems have been told that the drinking water is safe for use. On Aug. 7, Bates also released a statement in which he noted that officials with Navajo Agricultural Products Industry have assured Navajo Nation officials that the contamination will not adversely impact the enterprise’s water supply or products because it diverts water directly out of Navajo Reservoir which does not receive any water from the Animas River. In an Aug. 8 press release, Navajo Tribal Utility Authority officials state that there is no threat to the drinking water from the spill, which includes the NTUA water system in the northern New Mexico portion of the Navajo Nation. NTUA Deputy General Manager Rex Kontz, said that the NTUA water system from Farmington to the community of Beclabito is not impacted. Additionally, as a precautionary measure NTUA has shut down a water treatment facility in Mexican Hat that provides service to the community of Halchita in Utah and two water wells in Montezuma Creek. NTUA is providing water to the communities from alternative sources. Bates continues to urge the public to keep their livestock away from the San Juan River and to refrain from any contact with the water until testing and evaluations are complete. The Council is scheduled to receive an update from emergency management officials on Monday, Aug. 10, beginning at 2 p.m. in the Council Chamber in Window Rock. The meeting is open to the public. The Office of the Speaker is working with the Office of Broadcast Services to live-stream the meeting. This entry was posted in News Articles, Professional Journal and tagged EPA, Gold King Mine, Lake Powell, Navajo, Navajo Nation Council, Navajo Tribal Utility Authority, New Mexico, San Juan County by Marley Shebala. Bookmark the permalink.